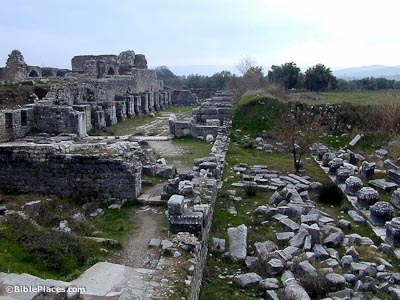 Paul visited Miletus for a day or two as he waited for his messengers to return with the Ephesian elders (Acts 20:15). When they arrived, he gave them a message of warning, his only recorded sermon given exclusively to believers (vv. 18-38). Apparently after his release from imprisonment in Rome, Paul visited Miletus, as he notes leaving Trophimus in the city (2 Tim 4:20). The photograph at left depicts the agora of Miletus. Archaeological work has been done mostly by German teams. In 1899, excavations began by the Berlin Museum. Professor Wiener of the German Institute of Archaeology is supervising the most recent excavation and restoration work. Like all Roman bathhouses, this bathhouse had an apodyterium (dressing room), a frigidarium (cold room), a tepidarium (warm room), and a caldarium (hot/steam room). Here there was also a broiler room and exercise area; statues of Greek gods were located in the halls. 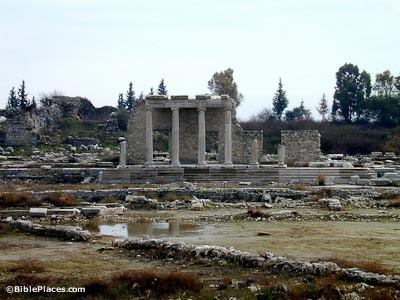 Miletus was located on a small peninsula that jutted from the south into the bay of the Meander River. 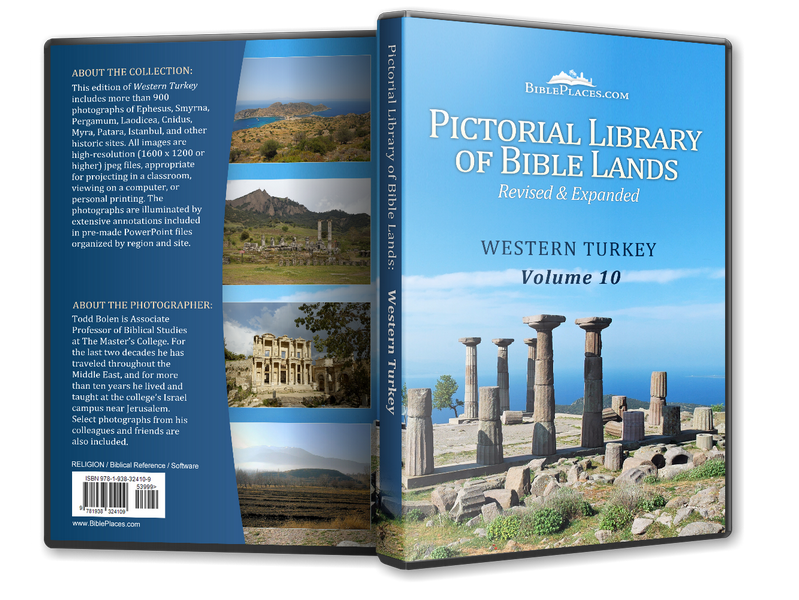 The ancient bay made an obstacle for direct land travel from Miletus to Ephesus. 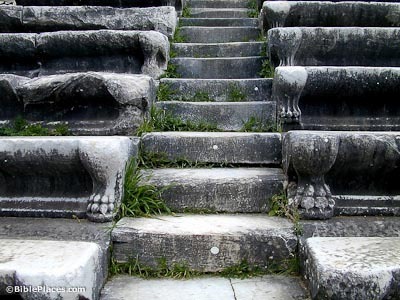 Today, Miletus is 5-6 miles (9-10 km) away from the Aegean Coast because silt has filled the bay. 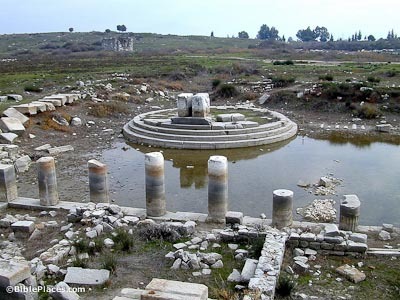 Direct travel between Miletus and Ephesus is now possible on dry land. The southeastern extremity of the ancient bay is now a lake (Bafa Golu). The theater of Miletus was built in the 4th century BC after Alexander the Great defeated the Persians who controlled the city. 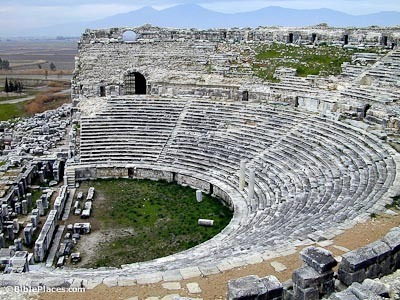 In its first phase in the Hellenistic period, the theater could seat 5,300. After being enlarged in the Roman period, it held 25,000. Byzantine construction over the proscenium destroyed remains of the stage building. The theater benches are decorated with animal legs and paws along the aisles. Nearby one of the seats has a Greek inscription which reads “to the Jews.” Other evidences attest to the presence of a Jewish population in Miletus in the first century.